10 Chiropractic Marketing Tips To A Successful Practice! The easiest way to avoid those pit falls is to plan ahead to prevent the most common errors by chiropractors when it come to marketing their practice. Here are a few tips to keep in mind. As you will notice many of the suggestions are things you and your staff can do on your own. If you haven’t done so in the past, start today by correlating your marketing dollars spent to your dollars earned. Each dollar should be accounted for with a positive ROI, Return on Investment. Community outreach is key to building relationships with those who will be vital to your referrals. Partner with similar neighboring businesses. Offer free screenings at events, fairs and seminars. Attend the Chamber meetings monthly, if you are unable to attend each month, send a staff member to represent your practice. Is your interior welcoming and inviting to your patients? Can new patients see your sign from the street? Do you have a 24 hour answering service so that all calls are answered? Have you done an office audit? Does your practice reflect your talents and abilities? The affluent use the internet more than any other income group. Can patients make an appointment online? 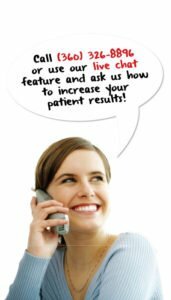 Engage and Maintain consistent communication with your current patients. Make sure you are getting the right message to the right people. Is your practice attracting the types of patients that fit your “ideal patient profile”? If not, why? Are you marketing in the wrong areas? Marketing to the wrong demographics? If you do Personal Injury, is at least 20% of your practice made up of personal injury patients? If not, a stronger focus on personal injury is highly recommended. Many of the items we mentioned can seem overwhelming, time consuming and expensive but guess what, it doesn’t have to be. We specialize in getting chiropractors results and guarantee our solutions! As you may have heard us say before and we will say it again, your marketing dollars are an investment, not an expense! With a good plan we can help you get there without the stress or worry about maintaining, retaining, reactivating and attaining new patients. Contact us today to set up a FREE One Hour Coaching on how to implement many of our tips. (Normally our market planning coaching is $150/hour). We want to be your marketing partner and we are committed to making it the best year you have ever had!